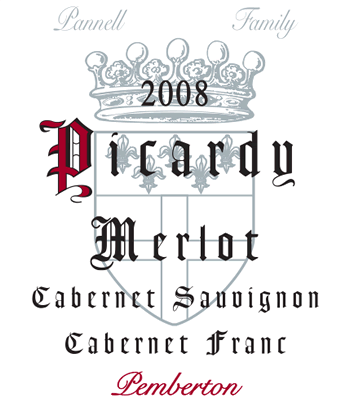 Picardy Merlot/Cabernet is a blend of approximately 40 Merlot, 30% Cabernet Franc and 30% Cabernet Sauvignon. This is a wine in the style of the Merlot dominant St Emilion/Pomerol region - fruity but elegant and with excellent structure which will reward cellaring. The outstanding features of this wine are its structure, fine grained tannins, low pH without high acidity, excellent colour and pronounced fruit flavours. It should drink superbly for up to twenty years. The vineyard is planted to 50% Merlot, 25% Cabernet Sauvignon and 25% Cabernet Franc. However, the final wine's composition may not reflect these percentages because climate can create ripening problems for Cabernet Sauvignon in cooler seasons. The vines carry a maximum of 8 tonnes per hectare and excess fruit is hand thinned at veraison. To help keep crop levels down the vineyard is non-irrigated and cane pruned. In the future there may be some Malbec added to create further complexity. The fruit is ripened to around 13.5° baume, depending on flavour. It is then hand picked and transported to the winery (only 400m away), on the Picardy estate. In the winery it is destemmed, lightly crushed and then pumped to the overhead small fermenters. The fermentation is carried out at between 28 and 32 degrees Celcius for 10 to 14 days or until the cap sinks. During fermentation the wine is hand plunged 3 times per day. The wine and skins are run directly from the bottom door of the fermenter into the airbag press. The must is then pressed firmly. The different ferments and varieties are then blended at this stage to give maximum integration time, where most wineries blend post oak maturation. We also attempt to ferment the Cabernet Franc either with the Merlot or Cabernet Sauvignon, to further enhance integration. After blending the wine is then settled for up to one week and then matured in new to four year old French oak barriques. While in oak the wine undergoes malo-lactic fermentation and each barrel is checked and topped up fortnightly to prevent oxidation in the headspace. This prevents formation of volatile acidity and is facilitated by all the barrels being at floor level, not stacked. If required the wine may be racked during its oak maturation. After twelve months in oak the wine is racked out of barrel to a tank and then given a light filtration on its way to bottle.